“Title of Show” type musical about a young composer/lyricist’s struggle writing an autobiographical show aided by his imaginary helpers. Uh oh. 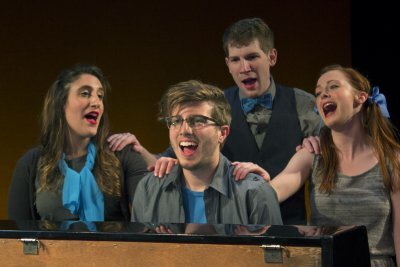 Presented by The New York Musical Theater Festival, HeadVoice can best be viewed as an audition vehicle showcasing the potential of its young creator’s talents. As an actual work of musical theater, it is a minor and inconsequential exercise. It is in the mode of [title of show], the lauded but divisive inside show business cult musical. Eric, a young man in his early 20’s nervously enters through a door onstage and sits at a piano and plays. He is writing a musical about his life and is soon joined by a young trio, two women and man. They represent his “thoughts,” and perform the various characters in his story as well as dealing with his temperamental personality. Born in New Orleans to an absent father and domineering mother, Eric becomes obsessed with musical theater. This fascination is fulfilled when he and his mother visit New York City and they see Wicked. After battling with her about his chosen career path, he moves to New York City to work in musical theater. Ethan Andersen wrote the book, music, lyrics and plays Eric. The book is a purposeful collection of often stylized biographical incidents, observations, and expressed emotions. Though much is humorously made of Eric possibly being gay because of his musical theater fixation, his sexuality is never conclusively explored. This omission leaves the show in the realm of arch cuteness and is a factor preventing it from achieving more of a sense of developed reality. The score is quite professional and contains a variety of accomplished comedic and dramatic songs. There are echoes of Sondheim, Kander and Ebb, Stephen Schwartz, and Comden and Green. Besides Wicked, there are references to Dreamgirls and Evita. Mr. Andersen’s performance is animated and engaging, ranging from sincere to overwrought. A repetitive routine where he raises his hand and does a finger snap to indicate scene transitions grows annoying. 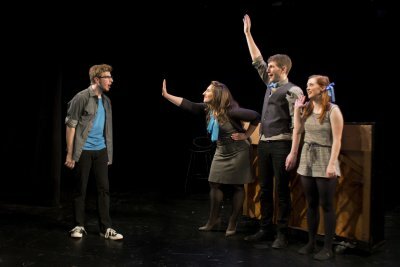 Katie Emerson, Nicole Dalto, and Matthew Summers are all peppy and highly talented vocally and personally as the imaginary figures. Each has several big solo turns that they winningly perform as well as perfectly interacting with each other and Mr. Andersen. Director and choreographer Charlie Johnson does a fine job of giving the show a brisk pace and razzle dazzle despite the small-scale production. The expert efforts of lighting designer Alicia Varcoe and sound designer Evan Lutvak greatly contribute to the scope of the show. There is creativity on display but not enough to transcend the slight and limited material. Friends and relatives of Mr. Andersen, theater geeks, and theater professionals will find much to admire and relate to in HeadVoice. Anyone else would most likely be amiably bored. An innovative interpretation of the classic adventure, "Treasure Island," this is an enchanting evening full of affable characters and catchy show tunes. Zany and original, this new musical about a herd of wild buffalo is light-hearted but meaningful and appropriate for an audience of any age.